In the evening Colin Fisher, launched Rohantime. I don’t think any of us knew what to expect. 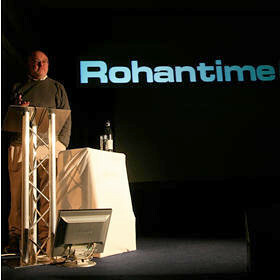 We hoped Rohantime would become the heart of the Rohan Community, talking about issues important not only to the Rohanists but the wider outdoor and travel community. A lot has happened since then! Did you join us? Please share your memories in the comments below. Rohantime has changed over the year. It has developed to accommodate all the varied content from the Rohan community. The energy has come from all the people that use Rohantime. We remember the event well. We were fed and watered at a fantastic location and kept entertained by various guest speakers including David Bellamy and most importantly, Sarah Howcroft! As a store we use Rohantime very often, it is a great way to communicate with our customers by being able to share stories and photos. Thank you to Sarah for always being at the end of a phone/replying to emails. Indeed I do remember :) Though it now seems a lot longer ago even than 9 actual years!